GUIYANG, Aug. 3 (Xinhua) -- Chinese State Councilor Liu Yandong Tuesday proposed that China and the Association of Southeast Asian Nations (ASEAN) study the feasibility of educational integration at a proper time to ensure the supply of skilled people for the development of the China-ASEAN Free Trade Area. Liu, who is also a member of the Political Bureau of the Central Committee of the Communist Party of China (CPC), made the remarks at the opening ceremony of the first China-ASEAN Education Minister Roundtable Conference and the third China-ASEAN Education Cooperation Week in Guiyang, capital of southwest China's Guizhou Province. China and ASEAN should make efforts to integrate their educational resources, remove obstacles preventing student exchanges and encourage the recognition of academic degrees conferred in respective countries, so as to enhance the attraction and competitiveness of higher education in the region, she said. "The Chinese government has always attached great importance to educational exchanges and cooperation with the ASEAN nations," she said. The two sides had established a comprehensive partnership of cooperation in education and developed new methods of educational exchanges with regional characteristics. Liu said the China-ASEAN Education Minister Roundtable Conference marked a new stage in educational exchanges. The conference was one of the major initiatives proposed by Chinese Premier Wen Jiabao at the fourth East Asia Summit in Thailand in October last year. It is the highest-level international meeting in the field of education under the framework of China-ASEAN cooperation. "It is our shared responsibility to promote people-to-people contacts with a focus on education between China and ASEAN countries," she said. China was ready to strengthen cooperation with ASEAN in people-to-people exchanges, she said. Liu suggested China and the ASEAN nations create a new mechanism for exchanges, such as a high-level consultation mechanism, and institutionalize cooperation in education, science and technology, culture, health and sport. 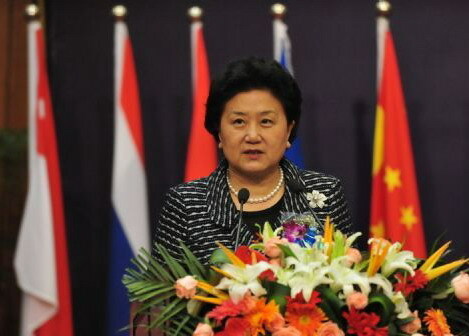 She said they should make use of the China-ASEAN Center to promote friendly contacts and increase mutual understanding. The China-ASEAN Center aimed to further tap cooperative potentials and attract more partners beyond the region. Liu called for the implementation of the two China-ASEAN 10,000 Student Exchange Programs, making sure that the number of exchange students from ASEAN countries to China reached 100,000 by 2020 and vice versa. China would offer 10,000 government scholarships in the next 10 years for students from ASEAN countries, she said. She said China would invite around 10,000 young teachers, scholars and students from ASEAN nations to attend language, culture, sports and art programs in China over the next 10 years. The annual China-ASEAN Education Cooperation Week activity was launched in 2008. The project aims to promote mutual understanding among young people and deepen the intercollegiate cooperation, and push forward the common economic and cultural development.